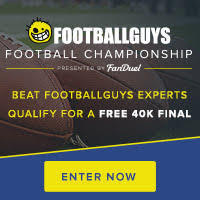 I just posted my Week 17 FanDuel stacks. I cover highly-owned stacks, less common stacks, matchups with shootout potential, and defensive stacks. Here's one stack idea. Be sure to check out the full article for tons of other stacks. With Todd Gurley doubtful for Sunday's game at San Francisco, Tre Mason will step into the Rams' starting role. Over the last five weeks, the Niners have allowed a league-worst nine rushing touchdowns. Mason is only $100 over the running back minimum price and should be used heavily in all formats. The Rams defense is the best value at their position. They should have have no problem vexing a Niners team that has averaged less than 15 points per game and lost by an average of more than 10 points per game this year.